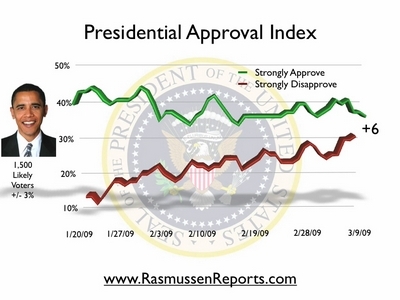 On Obama’s first full poll in Office (01/22/09) Rasmussen Reports had his Presidential Approval Index at +30%. Since then it has steadily ticked down to it’s current level of only +6%. Mainly, this has been due to the sharp rise in the “Strongly Disaprove” category which has move from only 14% up to it’s current level of 32%. Unlike every other poll listed on the RCP average, Rassmussen is the only one that tracks “Likely Voters.” All others track either “Registered Voters” or even “Adults.” Neither of these are accurate predictors of voting behavior. Rassmussen is also the only “Daily Tracking Poll” I have seen. Even so, the other polls also continue to show decline. For example, Gallup (Adults) has moved from +56% to +45% to +36% on 3/6. While this is still very high, dropping 20% show statistically significant negative movement in this apples-to-apples comparison. In 2008, Rassmussen had Obama 52%, McCain 46% on election day. The actual result was Obama 52.87%, McCain 45.62%. Next: Thanks Democrats! Greater New Bedford’s 12.6% Unemployment is Mass Highest!